Zeel launched in early 2012 to bring the ZocDoc model to alternative healthcare providers. In other words, just as ZocDoc makes it easy to search for doctors based on specialty, proximity and insurance coverage and book appointments directly, Zeel aimed to do the same for the other half of the market: From massage therapists and personal trainers to nutritionists and acupuncturists. Since then, Zeel has gone on to onboard thousands of wellness providers and book thousands of appointments for a wide range of practitioners. However, during the past 18 months, one vertical in particular emerged as the most active and the most significant source of traffic: Massage. The team discovered, co-founder Samer Hamadeh tells us, that about half of its appointment requests were for massage, many in-home and that over 55 percent of those requests were for same-day service. Because the industry isn’t set up to capitalize on same-day requests, the co-founder says, the startup decided to abandon the horizontal approach and refocus its efforts on massage, specifically of the on-demand and in-home variety. Zeel soft-launched its on-demand massage service in December, but eager to become a mobile-first product in the same way Uber provides on-demand car services, Zeel began developing iPhone and Android apps. Today, Zeel is officially announcing its new, massage-focused product and releasing its iOS app (with Android to follow next month), allowing anyone and everyone to book same-day, in-home massage appointments while on-the-go. 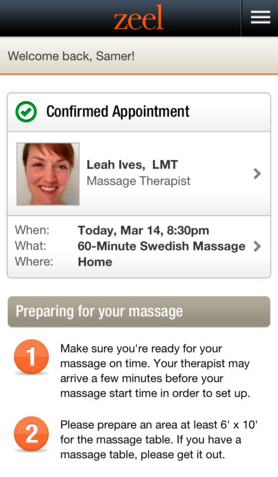 Through its app, Zeel now enables users to select a 60 or 90-minute massage, specify whether they prefer a male or female massage therapist, decide between Swedish and deep tissue massage, and indicate their location and preferred appointment time or time window. When they hit “Book now,” the request goes out to nearby, available therapists one at a time, much like requests to Uber drivers, until one of the Zeel therapists accepts the request. Hamadeh says that the over-arching motive behind its new product is to, simply put, make massage accessible to everyone. Furthermore, it aims to solve the hassle around booking a massage — having to call around and schedule in advance, for example. The startup has recruited over 100 licensed and vetted massage therapists who are available on-demand and will confirm appointments and be on their way within minutes of booking your appointment. Zeel is also attempting to take some of the hassle out of the process by offering a set price (including tax and tip), which is charged directly to users’ credit cards. And, because in-home massage inherently has the potential for all kinds of creepiness, the co-founder assures us that all of its therapists are vetted (in person), licensed, certified, insured and own their own portable massage tables. As to why Zeel decided to limit its potential market by focusing on massage, rather than the alternative? Hamadeh hopes that by focusing on one vertical and doing it really well Zeel will be able to build a more meaningful (and useful) service than trying to be everything to everyone. In turn, he tells us that there are currently over 290,000 licensed massage therapists in the U.S., 73 percent of whom are solo practitioners. Furthermore, 41 million Americans receive at least one massage each year, while the average customer books six appointments per year. By standardizing the price and removing the friction around booking and payments, Zeel hopes to be able to increase the frequency with which we indulge ourselves in a little massage. Particularly because, in truth, 44 percent of massage appointments are booked for medical and health reasons, many of which are ongoing. Hamadeh says, in its experience thus far, Zeel has found that 55 percent of in-home requests are same-day, but only 25 to 35 percent of those are actually booked. As a result, that market opportunity could be double or triple the amount of current massages. The other issue is that, when most people decide to book a massage, they want to be lying on the table within a few hours of booking. The reality is, the co-founder says, that appointments booked more than a day in advance on the old Zeel system tended to get cancelled or changed. And, on the therapist’s side, 30 to 40 percent of their day is free, and the average therapist has to work two or three jobs and doesn’t have health insurance — so even if an appointment means traveling far (and is inconvenient) most therapists will take it anyway. By using the Uber model, Zeel is able to help therapists book more appointments and organize their day in a way that doesn’t require them to travel 50 miles to an appointment, while removing the hassle of phone calls, and back and forths over SMS with customers. Of course, Zeel is hardly the only place or service to offer massage. There are a slew of options for people looking for a massage therapy solution, whether it be spas, health clubs, gyms and so on. There are in-home options, too, as people can turn to sites like Thumbtack and Craigslist to look for therapists. The problem is that most spas don’t offer on-demand, let alone in-home massage, and the marketplaces that do offer in-home service can be pretty sketchy or require you to submit a request to a therapist and hope he or she calls you at some point. On the customer side, it’s hard to verify that the person about to come to your apartment isn’t a serial killer, but Hamadeh assures us that his vetting process is solid and that all of Zeel’s therapists have stellar educational credentials, current state licenses, and excellent prior and current employment. Just as important, he says, is that the same safety issue applies for therapists, too. When customers sign up for Zeel, the startup uses a “major identity verification agency” to confirm their legal name, birthday, location, legal home address and so on. If things don’t check out, no massage for you. Only verified customers can book appointments, the co-founder tells us, in an attempt to provide extra security measures for therapists. And, on the customer side, Zeel vets and curates its roster of therapists itself with the goal of decreasing the creepiness factor on both sides of the equation. Zeel is initially only available in the New York City area, where the base price of a massage in Manhattan will costs $130 (and $120 in the outer boroughs) before tax and tip. While this seems high, Hamadeh says that it prices Zeel’s service favorably compared to spas like Equinox, Bliss, Four Seasons, Exhale as well as other in-home solutions in NYC. In fact, the team debated launching in New York first because of the pricing factor (everything is more expensive in the Big Apple). But, the co-founder said that the price of a Zeel massage in Manhattan will likely be the most expensive in the country. To that point, the startup plans to launch in a new city each quarter and will be coming to California in the fall. For readers in NYC looking to test out the new service, using the code “TECHCRUNCH” will get you a $25 discount on your first appointment. Zeel.com has raised $1.5 million in outside capital to date from a number of investors, including Prolog Ventures, a life sciences and healthcare venture firm, former Midway Games chairman and LogMeIn board member Ken Cron, long-time healthcare investor Esther Dyson, Lightspeed Venture Partners’ Ravi Mhatre and former Facebook director of monetization and current CRO at Pinterest, Tim Kendall, among others. Zeel at home here, on mobile here.